Three central banking authorities – the Bank of Canada (BoC), the Bank of England (BoE), and the Monetary Authority of Singapore (MAS) – have jointly published a report which assesses alternative models that could enhance cross-border payments and settlements. 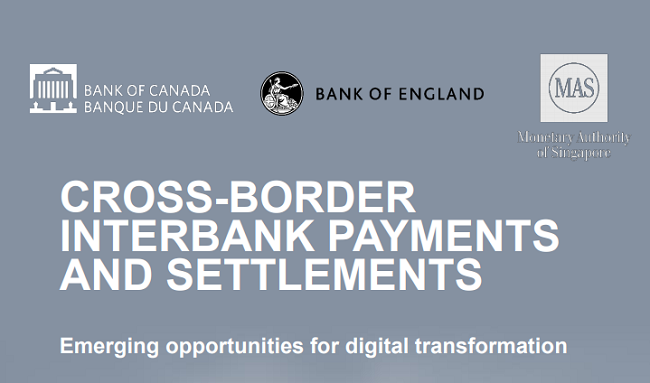 The report, “Cross-border interbank payments and settlements: Emerging opportunities for digital transformation”, examines existing challenges and considers alternative models that could help improve speed, cost and transparency for users. In particular, the report examines three models of cross-border payments – the first two are built on existing domestic interbank payment systems using traditional technology and a third model which focuses on the use of Wholesale Central Bank Digital Currency (W-CBDC) and its various applications through Distributed Ledger Technology (DLT). For the third model, the project considers three variations based on issuing a W-CBDC. It expands on previous work on this concept by exploring the benefits and considerations of using CBDCs for cross-border payments and settlements. “While all three variants offer some solutions to the challenges associated with cross-border payments, our analysis highlights the limitations of such technical innovation in the face of some intractable challenges across all three models,” the report said. In addition to the three central banks, the project was supported by a group of financial institutions led by HSBC. Contributors included Oversea-Chinese Banking Corporation (OCBC Bank), The Toronto-Dominion Bank (TD), United Overseas Bank (UOB) and Payments Canada. Recently, MAS Director Ravi Menon said that the MAS and the BoC have started work on linking their respective blockchain platforms to explore the possibility of instant, 24/7 settlement of cross-border payments transactions. The week, the MAS has also released a consultation paper on the creation of pre-defined sandboxes, called “Sandbox Express,” to complement the existing FinTech Regulatory Sandbox that was launched in 2016. The initiative is aimed at enabling firms which intend to conduct regulated activities to embark on experiments more quickly, without the need to go through the existing bespoke sandbox application and approval process. The MAS also co-organised a two-day Workshop on Digital Currency Economics and Policy to discuss how digital currencies will impact monetary policy and financial stability on 15 and 16 November 2018.